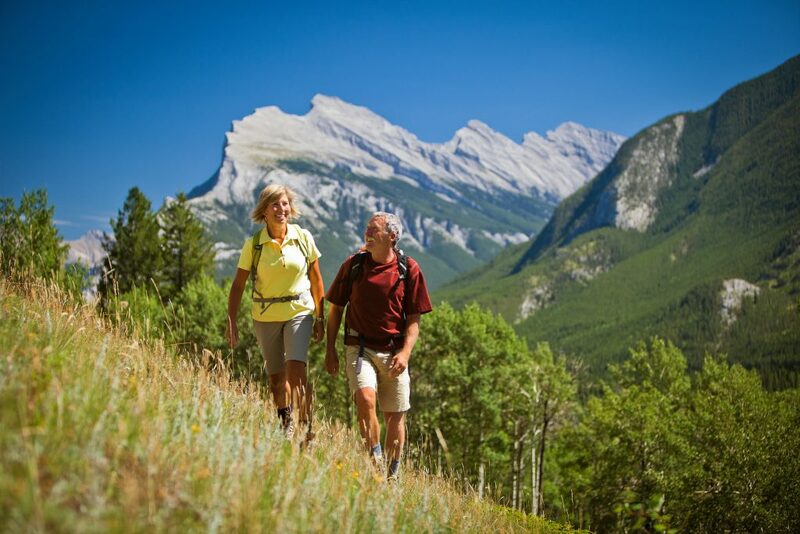 This journey is the perfect way to explore the Canadian Rockies at your own pace and in your own way. We talk about ‘road trips re-imagined’ because we keep the best parts of a traditional road trip – the fun and the freedom – and we take away the hassle of figuring out where to stay each night and what’s best do in each place. And in the Canadian Rockies, at most times of the year, you need to do this amount of pre-planning because it is very busy. As usual, the itinerary shown is just a suggestion – we can personalize it to suit all your needs. So call our Canadian insiders today, so we can help you co-create your best Canadian Rockies story. Hike into Grizzly country? Or go to the spa? Our included daily options offer something for all. An expert guide when you need one – and helpful advice when you don’t – also helps you make the most of your time and money. Return each evening to lovely hotels. Enjoy a hot-tub and fancy meal - or try two-stepping and a beer in a cowboy bar. Travel from cosmopolitan Vancouver to the mountain towns of Jasper, Banff and Lake Louise. Overnight at the Pan Pacific Hotel Vancouver. The Pan Pacific Hotel is uniquely located atop Canada Place, in the heart of the downtown waterfront. Your luxury accomodations rise above the cruise ship terminal and the Convention Centre, with some rooms having sweeping views of the Coastal Mountains and the city skyline. During your stay, enjoy a variety of hotel amenities including a fitness centre, heated outdoor saltwater pool and hot tub, sauna, and spa. Goldleaf includes assigned seats at the top of a two-level dome car with spectacular views; complimentary drinks; gourmet breakfast and lunch served in a dining room below; an outdoor viewing platform; and room-to-room baggage handling. It’s nice to simply walk down to the lobby of your hotel in the morning and know everything is handled until you reach your hotel in the evening. Since your main luggage is collected and sent on ahead to your hotel while aboard the Rocky Mountaineer, we recommend bringing only what you need for the day of travel – camera, medications, layers and other essentials. On arrival in Jasper, you will be escorted from the train station to your hotel on a Rocky Mountaineer motorcoach. Your onboard host will provide transfer details prior to arrival. Overnight at the Fairmont Jasper Park Lodge. Nestled in Alberta's magnificent Jasper National Park, a UNESCO World Heritage Site, the iconic Fairmont Jasper Park Lodge resort is surrounded by stunning mountains and wildlife seven kilometres (4.3 miles) from the Jasper townsite. The main lodge accompanies 56 adjacent cedar chalets and luxury signature cabins, connected by picturesque paths. The Fairmont Jasper Park Lodge features a heated outdoor pool, a world-class golf course, health club and spa, as well as several gourmet restaurants. Jasper's Bear's Paw Bakery offers delicious homemade stuff - one of our favorite spots! Enjoy a privately guided tour of Jasper's alpine passes and winding mountain roads, on a professionally-driven Harley Davidson motorcycle and sidecar. Watch for antlers peeking through the trees on this small-group mini-bus tour to Maligne Canyon, Maligne Lake and - by boat - to mystical Spirit Island. Sightseeing tours along the Icefields Parkway are typically a full day. If you'd prefer a more relaxed pace, ask us about other transportation options. This evening you’ll relax and refresh with an indulgent dining experience. Surrounded by spectacular lake views, savor a 3-course meal at Fairmont Chateau Lake Louise. On today's sightseeing tour, you’ll explore the Icefields in all its glory. You’ll walk on the Athabasca Glacier, stop for lunch, and step bravely out onto the Glacier Skywalk (whether you look down or not is up to you)! Spend the day with your own private guide making stops to explore as you drive along the scenic Icefield Parkway at your own pace. Your tour today includes a private helicopter experience and picnic lunch. Overnight at the Fairmont Chateau Lake Louise Hotel. The hotel is surrounded by soaring mountain peaks, the majestic Victoria Glacier and a glistening emerald lake. Enjoy the fully equipped Health Club, including an indoor heated pool, whirlpool, steam room, and fitness centre. Additional amenities include a spa & salon, on-site activity centre, boutique shops and several gourmet restaurants. Discover the year-round outdoor activities from canoeing, horseback riding and mountain biking to skiing, ice skating and more. For a good vacation - as for a good story- a varied pace is important, and today you set the cadence. Relax, stroll around the lake, go to the spa – or ask us about getting out for an adventure like canoeing, horseback riding, hiking or climbing. To experience Lake Louise at its best get out early and walk around the lake – magical! Relax and enjoy the scenery as you make the short journey to Banff. Sightseeing stops and commentary are included along the way. Overnight at the Fairmont Banff Springs Hotel. This hotel stands as a landmark in the picturesque alpine town of Banff, Canada's ‘castle in the Rockies’. Just a short stroll from the town, the hotel features superbly appointed rooms and attentive personalized service. With a variety of on-site restaurants and bars, an indoor and outdoor pool, fitness centre, sauna, whirlpool, spa and salon, the resort offers year round activities from golf to unparalleled skiing. In Banff, be sure to visit Whyte Museum, to learn about Banff’s rich artistic and pioneering heritage. Enjoy a small-group tour to discover Banff’s unique folklore and natural history. You can take short walks along the way, and at the end, ride the Banff Gondola to the summit of Sulphur Mountain for spectacular views. See the Canadian Rockies from a fresh perspective on a relaxing cruise on beautiful Lake Minnewanka. Ask us about adding a day to visit the Drumheller Badlands – one of the best places for dinosaur fossils in the world. For couples and larger groups we think this is well worth it – saving both time and hassle. Overnight at the Sheraton Vancouver Wall Centre Hotel. This hotel is located in the heart of downtown Vancouver, a short walk from the trendy shops of Robson Street, art galleries, theaters and dining options. Enjoy well-appointed rooms, have a bite to eat at the relaxed hotel restaurant, or sip a cocktail at the bar. Additional amenities include a fitness center, on-site restaurant, pub, swimming pool and jacuzzi. Overnight at The Georgian Court Hotel. This hotel is situated in downtown Vancouver, steps from BC Place Stadium. It's a great base from which to explore nearby Yaletown and historic Gastown. Enjoy amenities such as a fitness center, hot tub, steam room and fine dining restaurant. Take out a complimentary bicycle to explore the city, or take a scenic ride along the Seawall in Stanley Park during your stay. Overnight at the Crimson Hotel. The Crimson is just minutes from the heart of Jasper and close to local attractions. The hotel offers a comfortable and relaxing vantage point to enjoy the beautiful Rocky Mountain surroundings! Enjoy well appointed, spacious rooms, and ample amenities including free Wi-Fi, an indoor pool and hot tub, fitness centre, and a restaurant and lounge to enjoy if you wish! Overnight at The Elk and Avenue Hotel. This property combines Banff’s alpine history with a sleek modern design and is conveniently located on Banff Avenue just minutes walk from downtown Banff. Relax and unwind in the hotel’s jacuzzi, steam room, or dry sauna after a day of exploring. Other amenities include complimentary WiFi, and on-site dining. Comfort and Superior hotels are paired with SilverLeaf Service on the Rocky Mountaineer Train. Deluxe hotels are paired with GoldLeaf Service. Deluxe level includes a personal chauffeured transfer service between Banff and Calgary. Superior and Comfort levels include a scheduled bus transfer. The Privately Guided Nature Walk route in Jasper may vary due to weather conditions at the time of travel. For best walking and hiking conditions we recommend trip departures between mid-June and mid-September. Due to seasonal operating restrictions, The Small Group Sightseeing Tour along the Icefield Parkway will be substituted with a Scheduled Transfer (no attractions) for departures prior to April 29th and after October 10th. Due to seasonal operating restrictions, the Maligne Lake Cruise will be substituted with a Nature Walk along Maligne Lake for April, May, and October trip departures. Nature Tour with Cruise on Maligne Lake - Operates from late May to early October. Weather conditions may cause season delays on early and late season departures. A walking tour will be offered when the lake cruise is unavailable. Icefields Parkway Sightseeing tour runs from early May to mid October. Motorcoach transfer will be subsituted in the early and late seasons. This trip is available for departures between April and October. Your staff is absolutely outstanding; informative, organized, and patient. This was probably the best organized tour we have ever taken. The Rocky Mountaineer train portion was one of the best; ease from train to accommodations, seats, service/meals, and commentary. The sub contractors (tours) Sundog and Discover Banff were professional, informative and personable. The train trip was great but we really like the day trips once we got into the national parks. Fresh Tracks did a great job and arranged just what we wanted.